Last year I lamented the Seattle Mariners and their tough luck losses in 1-run games. Last week’s 3 losses in a row to the Nationals in 1-run fashion reminded me to check in on who’s benefiting from a small sample size of close victories. You would expect teams to play about .500 ball in 1-run games. But looked to see which teams are being helped and hurt by tight victories, and what would happen if luck wasn’t necessarily in the team’s favor. Tampa, San Francisco, and Arizona are getting lucky in 1-run games. 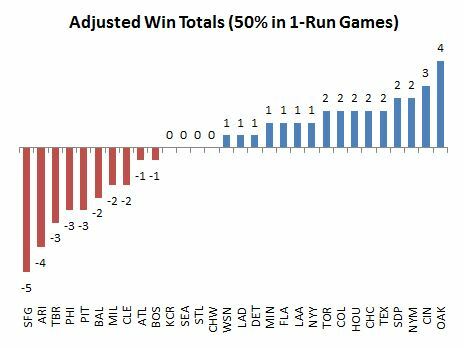 On the other end of the spectrum, Oakland and Cincinnati don’t have much luck, with the lowest win percentage in 1-run games. 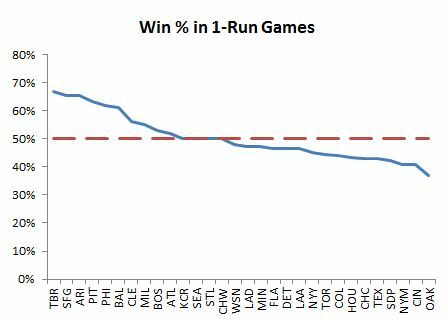 Interestingly, when I did this analysis last year, Oakland and Cincinnati led the league in 1-run wins, which demonstrates how random this stat is. 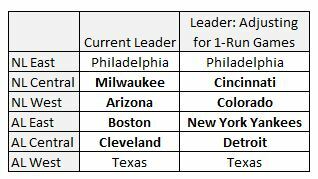 To correct for this randomness, I adjusted each team’s win total to reflect a .500 record in 1-run games. The goal was to eliminate the randomness from the records and see which teams really deserve to be leading their division. Take 5 wins from San Francisco and 4 from Arizona. They don’t deserve them. Oakland and Cincinnati improve, with 4 and 3 wins added to their totals. With all these adjustments, I determined the new MLB divisional leaders. Surprisingly, 4 of the 6 divisions have a change at the top. Just because upstarts Arizona and Cleveland are leading their division, don’t assume they are there to stay. They’ve been the beneficiary (and others the victim) of lady luck. Philadelphia and Texas look like the real deal. My poor Mariners – those 3 1-run losses last week were payback – they now have a .500 record in 1-run games.